Allison Winters is offended that you’d call her an Ovinfago. First impressions are important. After all, they’re how you’re most often judged by the world at large. I mean, most people’s first thought of me is “look at the fat, shy, transexual.” However get to know me and it turns out I’m not that fat. The same can be said for Baobabs Mausoleum. At first the game’s humor and presentation come off a tad bloated, but once it hits its stride I found the jokes hitting and the presentation charming. Numerous games go for the throwback shtick with varying success. Some, like Shovel Knight, use the idea to great effect, creating a wholly unique experience that fits right in with the venerated classics of the era. Others emulate the style but fail to grasp the finer points of the game design. 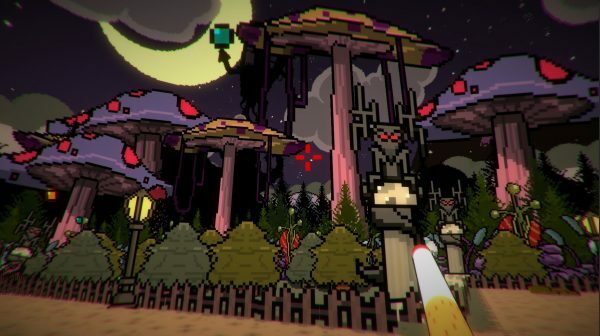 Baobab falls squarely into the former category, a pitch perfect parody of older PC games. The gameplay is mostly a series of puzzles, generally via finding the right item and giving it to the right person. However this description vastly undersells the experience, as the periodic changes in the gameplay affect how you tackle each new puzzle. 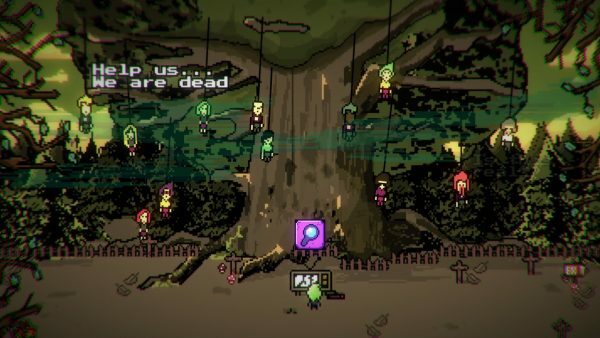 The game starts out as a simple adventure game, having you solve puzzles to get into a bar before becoming a streamlined RPG in the vein of Final Fantasy, then moving on to parodying early Doom-esqe first person shooters and so on and so on. However the constant shifts in perspective and gameplay are smoother than my legs when trying to impress a lover. The control scheme stays simple and the game never demands too much. I found myself having fun the whole time, through every twist to the action, and was genuinely excited to clear each act to see what the game would throw me into next. Last month I talked about moon logic puzzles and Lydia‘s unironic use of them. Here it’s firmly established that everything in Baobab is this way by its very first puzzle, which involves getting past a rat and into a bar to get a beer for the town drunk. The Rat hints that he’ll let you through if you can find him some pepperoni. However, the real solution is to trick the drunk with a gasoline filled beer bottle that allows you to move a truck five feet and get on a sailboat to get a nut to hock at the rat with an old catapult, killing it. The game railroads you in a sense to do these specific actions so that instead of yelling “how does that make sense?” you’re laughing at the way the game brought you onto its train of logic. It’s one of those subtle, brilliant moments that so many games are missing, and once I learned to appreciate how this game was running I became more endeared to it. As I said above, the game left a bit of a sour taste in my mouth in the beginning as I felt the humor was trying too hard to be fourth wall breaking, but as the game went on and the humor went from self-referential to our intrepid hero being done with everyone’s shenanigans, I started actually laughing at the game. The story follows Watracio Walpurgis, an FBI agent stuck in a small town after a car mishap. The game is trying to invoke the feel of shows like Twin Peaks and Gravity Falls with a tongue stuck firmly in its cheek and it works. The game has weird creatures that are just there, an alien subplot that you actually get to play a role in, and our main character is a cigarette-smoking eggplant man for no real reason. The story is not the kind I was into out of desire for a resolution to the mystery, but more just the enjoyment of the journey. Everything about it is parodic to the point that I wouldn’t be surprised if we never see episode two because the creator thought that’d be the funnier joke. The art is presented to us via a VCR that has seen better days, with decent sprite work and ludicrous gore effects . If you’re saying to yourself this sounds awfully like Hotline Miami then you are correct, and if you aren’t then you probably haven’t played Hotline Miami. It truly fits the low rent early 90’s aesthetic that the game seems to be striving for and it grew on me. Shout out to the movie theater that I think it might be an allegory for hell but I’m not sure, which smashes together a normal movie theater with screwball monsters. It’s the high point of the game even if I was stuck there due to my poor playing skills. Baobab makes for a great lesson on how to do a solid parody. Despite its shaky intro, the game came into its own rather quickly with smooth gameplay transitions and an enjoyably snarky main character. If there are more episodes to follow then I’ll eagerly await them and even if there aren’t this game stands by itself just fine. Definitely pick it up at your earliest convenience if you haven’t already.